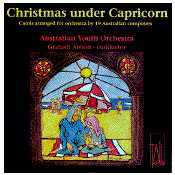 The Australian Youth Orchestra plays 19 Christmas carols arranged especially for this recording by Australian composers and conducted by Graham Abbott. The two carols that have each been set twice make very interesting comparisons. The music is immensely listenable, and you can give it away for Christmas with impunity! The selection of works includes "God Rest Ye Merry Gentlemen" arranged by Carl Vine as a slow waltz as part of his music to the ballet "A Christmas Carol". For more information on this CD visit the Tall Poppies website.